The Special Reserve Series are the winery's flagship wines. This collection perfectly expresses the best in every harvest, from outstanding vineyard plots. 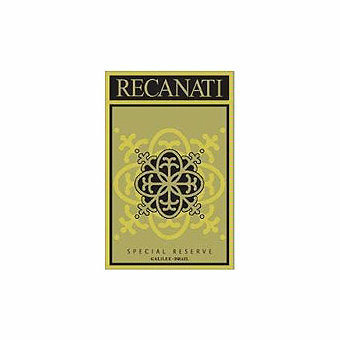 From these plots, Recanati's winemakers produce the wines that exemplify the winery, the harvest and the terroir. The blend varies from harvest to harvest but is always based on Mediterranean and classic Bordelaise varieties. Once the grapes arrive at the winery, they are destemmed and gently crushed. After fermentation in tanks and pressing, the wine is transferred to new French oak barrels. During the first months of maturation, each vineyard's produce is kept separate. Afterwards, a series of tastings determines the right blend from the most outstanding barrels in every harvest. Once the blend has been crafted, the wine is returned to the barrels where it will mature further for another 18 months. Kosher. Wine Spectator scored this 90 points saying "Juicy and rich, with lots of red plum and raspberry flavors that feature fresh acidity. Licorice notes show midpalate, presenting a finish that has accents of milk chocolate and paprika. Cabernet Sauvignon, Syrah, Marselan and Carignan. Kosher." and Wine Enthusiast Magazine scored this 91 points saying "This deeply-colored wine has a bouquet of cherry, pomegranate and white chocolate. It has flavors of black cherry jam, anise, mocha and a touch of orange peel. Mouth-coating tannins provide a matrix for an interesting touch of spiciness that gives way to a final taste of pomegranate."